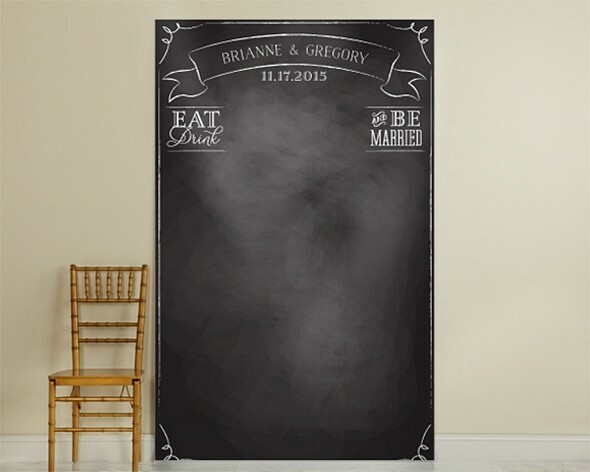 Featuring a vintage-chalkboard motif, this beautiful "Eat, Drink and Be Married" photo backdrop is perfect for a rustic or vintage-themed wedding. The backdrop may be personalized with two lines of custom text above the "Eat, Drink and Be Married" design. Available only in the colors and fonts shown. PLEASE NOTE: Mounting supplies are not included with the backdrop. Each backdrop ships in a mailing tube and is made of tear-resistant 7mil polypropylene that is water-resistant with a scratch-resistant coating.